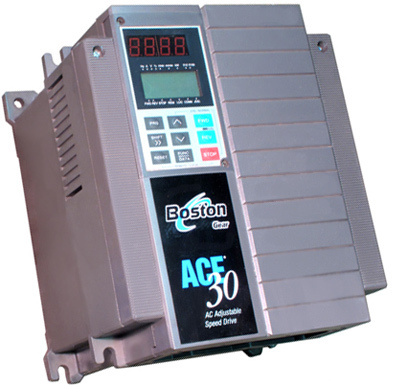 Boston Gear AC motor controller. Adjustable frequency. 380 - 460v, .1 - 120 Hz. Includes manual. New in box. Made by Fenner. Two soft start circuits to choose from, 3 phase or single phase. A must where easy, slow start up is required. Board adjustments for starting torque and motor acceleration rate. Includes full documentation and troubleshooting guide. 120 / 220v AC, 50 / 60 Hz, 1 phase, 7.5 amps. 7" x 8" x 3-1/2". New, unused manufacturer's surplus. Includes manual. Three board selectable settings: 220 - 240v AC, 50 / 60 Hz, 380 - 415v AC 50 Hz, 440 - 480 vac, 60 Hz, all 3 phase, 2.5 amps. 7" x 8" x 3-1/2". New, unused manufacturer's surplus. Includes manual. Variable speed AC motor drive. Control any 230v AC, 3 phase motor up to 3/4 horsepower, 0 - 60, 72 or 120 Hz, 1.2 kva. Used, removed. Sold as-is without nomenclature. • Input: 208 / 230v AC, 50 / 60 Hz, 1 phase, 6 amps.